December « 2014 « Team Little Owl Foundation - Dedicated to raising awareness and keeping up the fight against childhood brain cancer. For the second year in a row, we have taken a Caribbean cruise over Christmas. We have found it helpful to check out of our reality and escape to warm weather and sunshine. Christmas is one of the most difficult holidays to survive without Allie, and this has become our tradition for now. We took a cruise again this year because Evie enjoyed the first one so much. 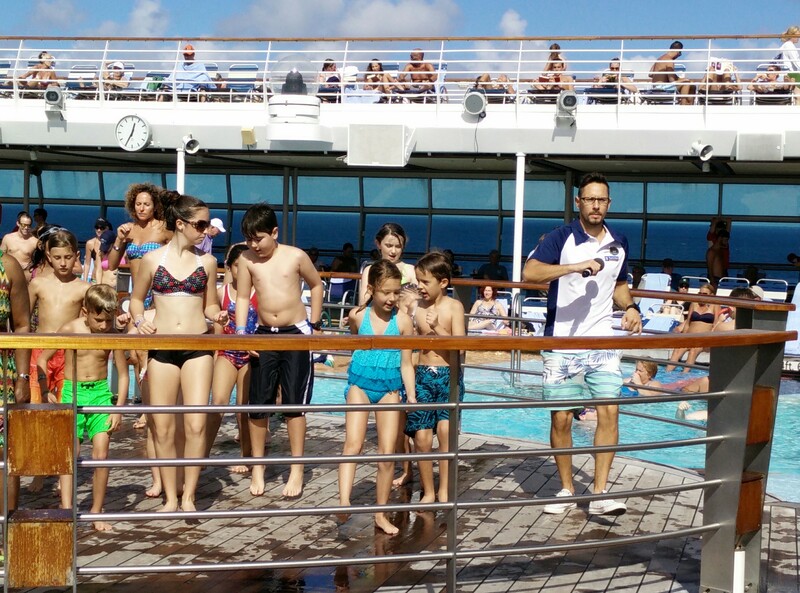 The cruise has a ton of organized children’s activities, and Evie loves to participate in all the games and contests they offer. This also allows Evie to meet other children and escape the boredom of hanging with her mom and dad all day. We try not to take it personally, but she chooses to leave us for most of the cruise. I get it. Evie is lonely at home, and she’s not going to be lonely on vacation. Early on during our cruise, Evie started telling us about her new friend, Jack. She was so excited, and she told us that they have so much in common. They are both seven and their birthdays are only a day apart. Jack is from Arizona, and Evie thinks she is an expert on Arizona because we were just there last month. Evie said that she and Jack saw each other at the Scottsdale Target during our Arizona trip, but they thought they would never get to know each other. But their paths must have been meant to cross again. As amazing luck would have it (or perhaps due to the revisionist history of two seven-year-olds), they found each other on the same Christmas cruise! Kyle and I would see Jack at pick up and drop off at the kid’s club on board the ship. Like Evie, he was outgoing and very silly, and it was easy to see why they became fast friends during the week. 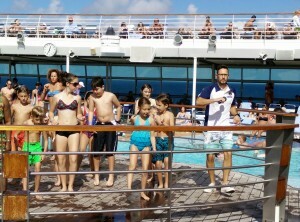 On the sixth day of the cruise, we were at the pool hanging out with Evie when she spotted Jack. There was a call for people to start line dancing (ugh) which I ignored, but Evie and Jack were the first two on the deck ready to go. Soon there was a full crowd ready to line dance, and they started with the Cupid Shuffle. Evie and Jack danced their hearts out in front of the packed pool deck. The cruise director even had Evie and Jack sing on the microphone as they led everyone to the left, to the left, to the right, to the right. It was the highlight of my trip to see Evie up there having fun and enjoying herself so fully. It’s hard for me to find joy most of the time, and I definitely didn’t think I would find it during a line dance. Yet, there it was. It wasn’t until the last day of the cruise that I truly understood the connection that Evie and Jack shared. While eating breakfast that final day, Evie mentioned to us that Jack’s mom had died. My heart hurt to know that Jack, like Evie, had been dealt the most unfair card in life. I asked Evie if she told Jack about Allie, and she told me that she did. I asked her how she felt when Jack told her about his mom. Evie said, “It felt like we had something in common.” I didn’t get any other details from Evie beyond that. My mind of course was left to wonder many questions. How did Jack’s mom die? Did she have cancer like Allie? How old was she? Did she die recently? But, there was one question I didn’t need answered. I knew why Jack ended up on a Royal Caribbean cruise over Christmas. His dad had to figure out a way to function for Jack’s sake and survive Christmas. I never met or even saw Jack’s dad while on the ship. Evie and Jack did not exchange contact information with each other, and their friendship ended when we walked off the ship. But, for one week, two grieving children found each other amongst the hundreds of other children on board. In the middle of the ocean, they laughed, they played, they danced, they sang, and they understood each other. I keep thinking about that line dance, and how only the two of them knew the sadness that they shared. To the crowd, it looked like two kids loving the limelight and having the time of their lives. What no one else could see was the emotional scars and grief that they will always carry. These two little kids have been forced to grow up early. They know that there are things beyond our control, and they know the pain of a broken heart. The early and traumatic deaths of their family members will shape the rest of their lives. They will never know a normal childhood. It will always be off. But, the one thing that wasn’t off, was their Cupid Shuffle. Even with heavy hearts, those two grieving children remained light on their feet and relished their moment together in the sunshine. And, even though I hate line dancing, part of me knows that I should be following their lead.